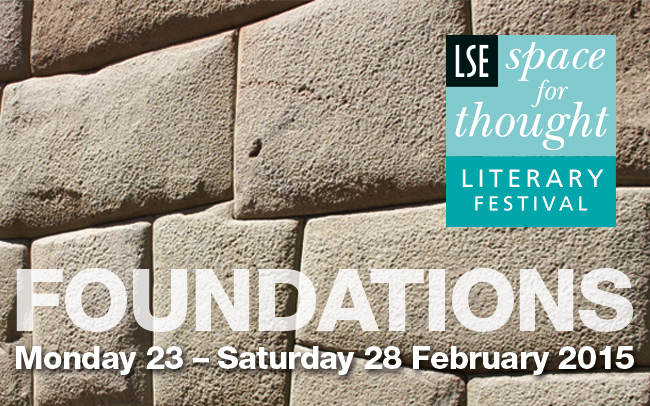 Space for Thought, a literary festival organised by The London School Of Economics (LSE), starts today. Each year, the Festival seeks to explore an idea at the heart of LSE, encapsulated in the motto: to understand the causes of things. This year, the theme is foundations, and the Festival will therefore examine foundations of various sorts: of knowledge; of society; of identity; of literature. The Festival has several events of particular interest in Asia. Likewise, several of the participating authors are either from Asia, or of Asian extraction. Meanwhile, in 2013 - the latest year in which statistics are available - LSE had 1375 undergraduates and 1894 postgraduates from Asia, or 3269 Asian students in total. LSE also has its own Asia Research Centre, and this year one of the Festival’s venues will be the university’s newly launched Saw Swee Hock Southeast Asia Centre. Despite this internationalism, all events, and all material made available online, will be in English, with no plans for translation into any Asian languages, even when the events discuss, say, the foundations of society in China. For those unable to attend on the day, the organisers endeavour to make podcasts, and in some cases videos, available online of all Festival events for free and unrestricted download. Twitter users can also follow what’s happening during the week via #LSElitfest. In addition, the BBC World Service’s arts programme, The Forum, will broadcast the discussion Shaking up Foundations, so check your local schedules. Louise Gaskell, LSE’s Literary Festival Organiser, answers a few questions. It seems a wonderful idea for a university to host a literary festival. Is it common in the West for this to happen? Do you have links with any universities in Asia that host their own literary festivals, or participate in yours? If not, do you have any plans to forge such links? It is common for universities in the West to run events programmes and some of those with arts programmes do run similar types of events. What is unique about the LSE Literary Festival is that our programme of events explores the interaction between the arts and the social sciences. We do not have links via the Literary Festival with universities in Asia. Space for Thought is a fantastic title for a literary festival. How did you decide on it? And how did you pick this year’s theme, foundations? The LSE Space for Thought series was created to celebrate the completion of the New Academic Building at LSE, in 2008. These celebrations included an inaugural lecture series, with some of the world's leading academics, and LSE's first ever Literary Festival, which has now become an annual event. The new building was designed to provide a new space for thought on campus. The theme foundations was chosen partly in celebration of LSE’s 120th anniversary, which is this year, but also in recognition of the many other anniversaries being commemorated in Britain in 2015, including the signing 800 years ago of an early charter of liberties, the Magna Carta, and the victory over Napoleon at Waterloo, in 1815. Can you highlight some events of special interest in Asia? We have several events exploring art and creativity in Asia. For example, The China Dream, on Tuesday 24 February, with Professor of International Relations at LSE William A. Callahan, Chinese writer and critic Chan Koonchung, and writer and broadcaster Isabel Hilton. Global Development and Modern Fiction will see Bangladeshi author Zia Haider Rahman discussing his novel In the Light of What We Know with Head of the Department of Social Policy, Professor David Lewis. Rebellion and Foundation: Southeast Asia, the UK and 50 years of development, on Saturday 28 February, will explore the creative voices contending for the soul of a region where freedom, economic prosperity, civil society, and political maturity continue to evolve in unexpected ways with Malaysian artist Ahmad Zakii Anwar, producer and director Nickson Fong, and author and story performer Yang-May Ooi. Changing Worlds, also on Saturday 28 February, sees award-winning writer Neel Mukherjee in conversation with best-selling writer Elif Shafak and BBC presenter Bidisha on the foundations of society in India and Turkey. Is there anything in your archive of podcasts from previous years’ events which may be of particular interest in Asia?